Tyler and I will be featured on the radio this Wednesday, April 25th at 8pm! We are going to be interviewed on the Matt Dahl Radio Show. The show is broadcast every Wednesday from 7pm to 9pm and simulcasted on TPSRadio.net, Talksuperstation.com, and Sportsrantz.com. We will post more information so you can be sure to tune in at the right time and listen to our interview. Perhaps you will learn something new about the creators of Sharkadina... The Nationals (and hopefully the Shark) will be playing in San Diego that night (6:35pm start), but we hope you'll tune in for the spot! The Big Board DC, the bar where Tyler, Zac, and I watched Thursday night's Nationals game, will be hosting the first ever Sharkadina Night. The event is on May 10th at 7pm. It is going to be an event of gargantuan proportions. The bar is at 421 H Street (Metro accessible from Union Station). We'll be upstairs for the event, with the Nationals @ Pirates game on all the TVs. What better opportunity to watch an away game with fellow Shark fans than upstairs at The Big Board. The burgers are 'fin'tastic and the night's drink specials will include a special "Shark Attack" shot, and $4 Yueunglings (Sharklings?). More info about the event can be found on Facebook. Mark your calendars, dry clean your Shark hoods, and join us for Sharkadina Night. I want to say, "We're gonna need a bigger bar" by the end of the night. Sharkadina was featured on MLB.com after we had our picture taken at Friday's game. The best part is the thumbs up kid on the left. Also notice Tyler's "lucky" shark tooth. The Nats are 3-0 when he wears it to games (and 4-0 when anyone from Sharkadina shows up). We are an intimidating crew. Tyler and Zac went head-to-head on Nats Trivia at Friday's game. Apparently Tyler knows his Nats jersey numbers a bit better than Zac and wound up winning an Opening Day Hat and an Ignite Your Natitude t-shirt. Well done. That is all the news for now. The Nationals game was cancelled today because of rain. It will give the whole team some bonus rest before they travel to San Diego for a series with the Padres. 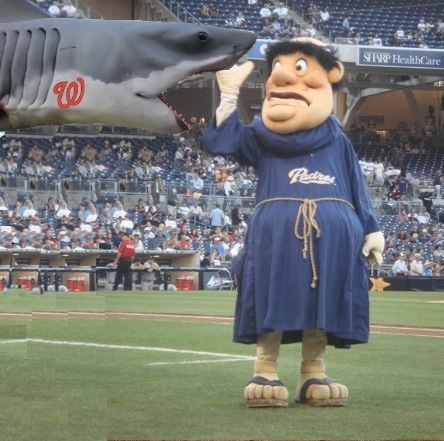 If you recall from last season, the Shark loves feasting on Padres. Wow, you guys ROCK. Keep up the awesome job and I look forward to hearing you on those shows! Gotta have something to entertain me at work.